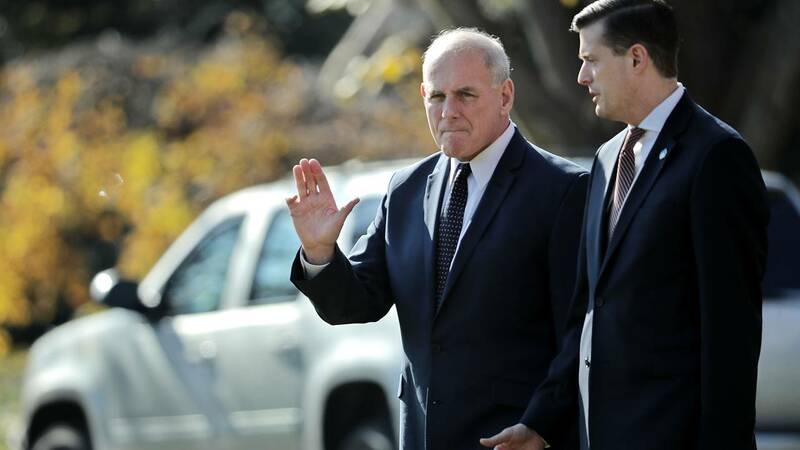 WASHINGTON (CNN) - White House chief of staff John Kelly is defending the handling of former White House staff secretary Rob Porter, who resigned last week after media reports revealed allegations by his ex-wives that he abused them. "It was all done right," Kelly told the Wall Street Journal in comments published Tuesday. Kelly has come under fire for his handling of the matter and initial statement of support for Porter, and FBI Director Chris Wray on Tuesday offered information about Porter's security clearance process that conflicted with the White House's stated timeline. Kelly said "no" when asked if the White House should have handled the scandal differently. CNN previously reported Kelly and other White House officials were aware of allegations against Porter for months, and that Porter was one of many top White House staffers who operated without a permanent security clearance. Wray said on Tuesday that the FBI had briefed the White House on several occasions about the status of Porter's investigation, submitted a completed background investigation last July and closed the file last month. In response to the first story detailing the allegations in the Daily Mail, Kelly vouched for Porter in a statement and said, "I can't say enough good things about him." In a statement released last Wednesday evening after further media coverage and the publication of a photo of Colbie Holderness, Porter's first ex-wife, with an injury she said came from Porter's abuse, Kelly said he was "shocked by the new allegations." Holderness told CNN she informed the FBI about the abuse allegations and subsequently provided the bureau photos from the alleged incident where she said Porter gave her a black eye. Arizona Republican Sen. Jeff Flake said Kelly is "wrong" to claim the White House handled the situation correctly, and referenced comments from White House spokesman Raj Shah, who said last week they could have handled it better. "I think it was mishandled," Flake said. "The White House said they handled it poorly, or could have handled it better. I agree." Flake, a frequent critic of Trump's tenor and behavior, said he is also "concerned" about what has come to light regarding the backlog of background checks for the White House, and when asked if Kelly should continue as White House chief of staff, Flake replied, "I am not going to go there." For his part, President Donald Trump addressed the issue on Friday without expressing sympathy for the women and saying Porter had "very strongly" said he was innocent. Members of both parties have expressed a range of incredulity to outrage over the White House's handling of the allegations and clearance for Porter, with Iowa GOP Sen. Joni Ernst telling CNN on Tuesday morning that she wants Trump to send a "stronger message" about domestic abuse.